Taking a Taj Mahal tour is the highlight of any India itinerary. Often referred to as being the most beautiful building in the world, the Taj stands out among Agra’s haze like a beautiful mirage. 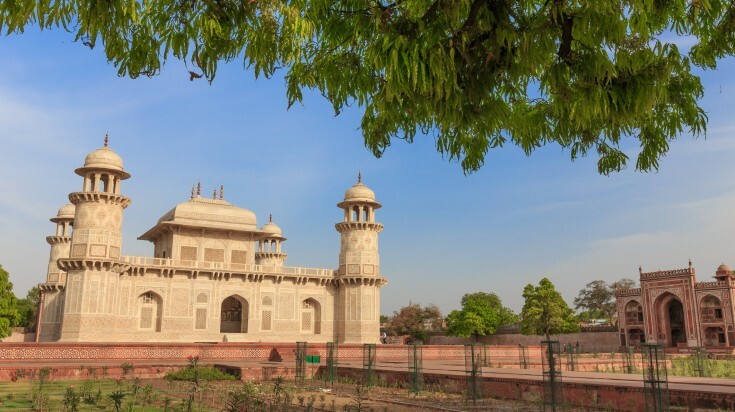 The ornately carved archways, the stunning white marble pillars, and the lush green gardens on the banks of the Yamuna river are guaranteed to take the breath away from even the most hard-to-please travelers. The Taj is India’s most famous monument and was built by Shah Jahan in memory of his beloved third wife, Mumtaz Mahal who passed away during childbirth. It is not a temple or a palace, but a mausoleum. The Taj took years, and the assistance of 20,000 workers to build. Sadly, following its completion, the Shah was overthrown by his son, who sentenced him to living out the rest of his life in jail while gazing at his beloved creation out of his cell window in Agra. After passing away, the Shah was buried alongside Mumtaz in the Taj. Today, millions of people visit the Taj every year. 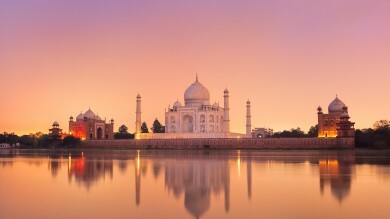 Best time to visit: October – December are the best months to visit Agra and the Taj Mahal. The weather is warm and pleasant without being too hot and humid and rainfall is at a minimum during this period. Ticket Price: USD 15* per person. Payment to be made via local currency. Visiting one of the seven wonders of the world is simple right? You just stroll through the main gates, get in line and wait to enter? Not so fast! There are actually three gateways situated around the Taj Complex that offer entryway to the site. Though the prices are the same, not all gates are created equal and there are a few things to consider before you go. 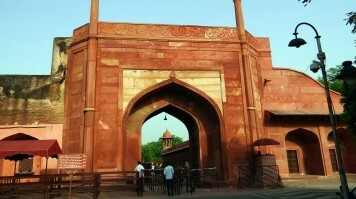 The western gate is the main entrance to the Taj Mahal facing out to Agra city. It may seem as though this gate is the most convenient in terms of accessibility, however it is also the most popular and queues here are typically much longer than at the eastern or southern gates. Try to arrive at the Taj early in the morning, or ready for sunset if using this gate. Locals predominantly use this gate. On most days, the eastern gate is a good entry point to use for the Taj Mahal as it is generally much less busy compared to the western and southern gates. This gate faces out towards Fatehabad and is a convenient entry point for tourists as it is the gate closest to many of Agra’s main hotels. 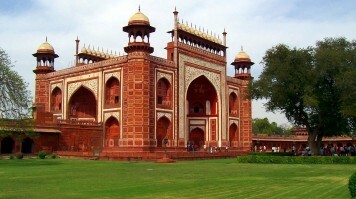 The southern entrance is the least used gate for accessing the Taj Mahal. It is surrounded by a busy market where you are likely to get pestered by toots, however it is arguably the best option for independent travelers or those staying in the nearby low-cost hotels. The only unfortunate thing about this gate is that it does not open until 8am so if you are hoping to be at the Taj for tourist-free photos as soon as it opens, this is not the gate to choose. 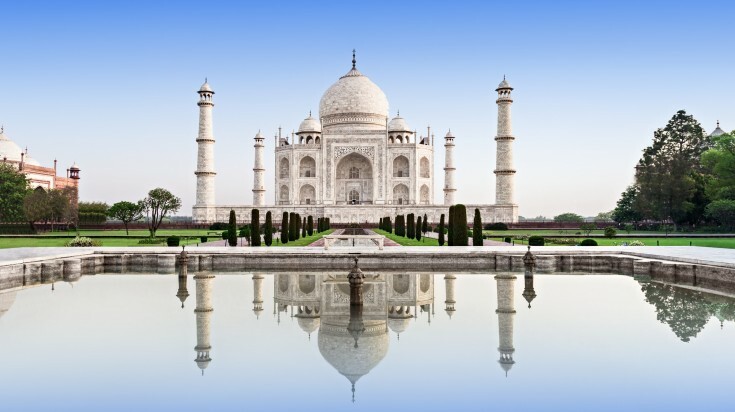 Tickets to the Taj Mahal can be purchased both online via the Archaeological Survey of India website, or from the various ticket offices that are situated close to each of the entry gates. It is not necessary to buy tickets in advance unless you are opting to participate in a night tour, that takes place 2 days before and a day after each full moon. However, buying the tickets the day before your intended arrival at the Taj helps you save time lining up on the day. At first glance, the Taj Mahal may simply appear as though it is just one building. However, upon arrival at the majestic whitewashed site, travelers will note that there are several notable attractions that make up the Taj complex. The main attractions of the Taj Mahal are the stunning and expansive gardens that encapsulate the mausoleum, the Lady Diana chair, and the interiors of the Taj complex itself. There is also an informative museum located on the complex, and a few additional buildings that are worth exploring (the tomb of Mumtaz Mahal’s grandfather, the mosque, and the assembly hall). It may seem obscure to list a gateway as one of the Taj Mahal’s major attractions, however the Taj’s main entryway “The Royal Gate”, also called Darwaza-e-rauza is so picturesque and ornately decorated that it is an architectural masterpiece, and a perfect place for travel photography in itself. Tourists entering from the eastern, western, and southern gate reach this epic gateway from where the first glimpse of the Taj Mahal is possible. The main gateway exists in the form of an octagonal hall with elaborate gates on either side. Commonly referred to as the “moonlight gardens”, the Mehtab Bagh gardens are stunning and expansive lawns and gardens filled with pastel colored flowers, fragrant rose bushes and lush greenery. 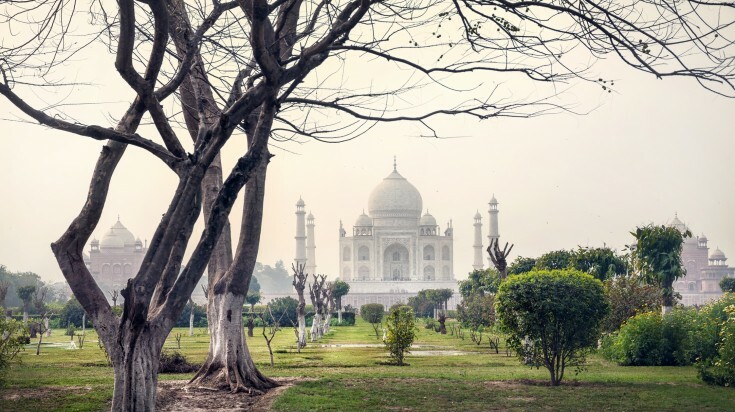 Located across the river from the Taj Mahal, the particular draw of the gardens is the incredible view of the Taj and photo opportunity that they offer, particularly as the sun begins to set. Upon arrival, make a beeline for the Lady Diana chair — the classic spot where Princess Diana sat during her visit to India in 1992 and the perfect place for a photo opportunity. As the day progresses, lines to sit here become incredibly long so you may want to boycott this if arriving later in the day. Enjoy exploring the expansive fragrant gardens that encompass the Taj and taking photos amid their perfect symmetry. Upon venturing inside the Taj, it feels as though the chaos of Agra has suddenly been replaced with the peace and serenity of the monument. The interiors of the mausoleum are exquisite, with elaborate tapestries, rich decorations and marble cenotaphs dedicated to Mumtaz Mahal and Shah Jahan. You will have to line up once more to enter the mausoleum, which is another reason why you should arrive as early as possible. The memorials that you see are actually decorative ones. The real crypts are situated below the surface and away from the tourists. There is a mosque, an assembly hall, and a museum situated close to the mausoleum entrance. The museum is an interesting place to visit and provides a fascinating insight into the history of the Taj, as well as displaying the original construction plans for its creation. Across the river from the Taj, encapsulated by the beautiful Mehtab Bagh gardens, the tomb of Mumtaz Mahal’s grandfather, Mirza Ghiyas Beg also known as I’timad-ud-Daulah awaits. 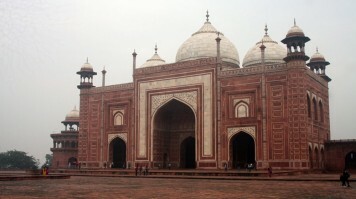 Often referred to as being the “baby Taj Mahal”, it is thought to have been regarded as a draft for the full-size Taj. With whitewashed walls there are some similarities between the Taj Mahal and the Baby Taj, however with its elegant marble lattice screens and jewel box structure, the Baby Taj possesses a unique look. A Taj Mahal tour is an amazing experience. And although you might want to visit it time and again and maybe you will, it is important to ensure that you make the most of your visit at the moment. The Taj opens at 6:00 and you should get there early if you want to avoid the crowds. Whether you need to make it to the Taj for the very first thing in the morning depends on whether you are set on capturing some great photos without tourist hordes in the back of them, or you don’t mind the hustle and bustle. You will often find that people are queueing to enter the Taj as much as 30 minutes before it even opens. After 10:00, hundreds of tour buses pull up to the site making waiting in line and getting around a little stressful. 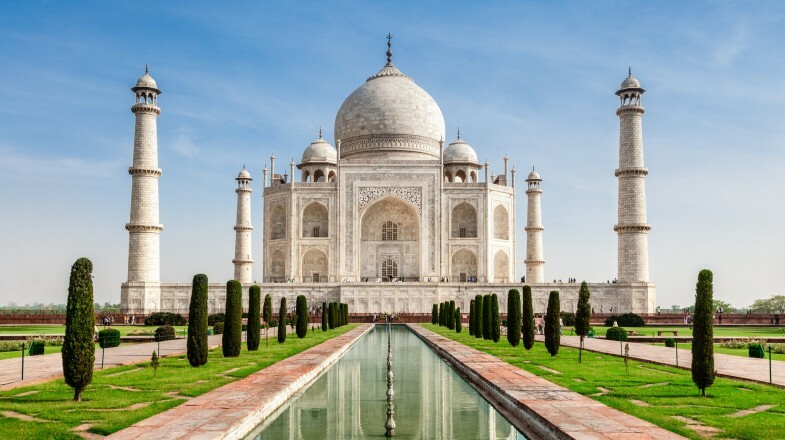 As is likely to be expected for visiting a place of burial, there are some rules to adhere to when visiting the Taj Mahal. The rules and restricted items at the Taj have been listed below in the next segment. One of them to really remember is that photography is strictly prohibited inside the mausoleum so it’s better to take all the photos you wish to take now. Not to mention, once you come out again, it’s likely there will be more tourists! For incredible pictures of the sunset over the Taj Mahal, cross the river towards the “Baby Taj”. 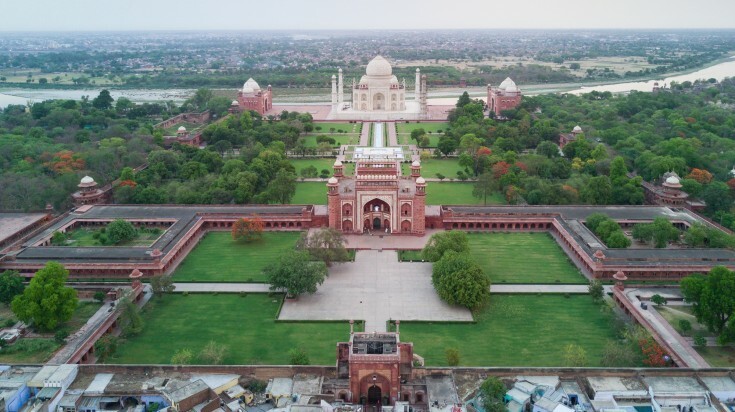 Explore the tomb and the restored Mehtab Bagh gardens, and watch the sun disappear behind the clouds and the majestic backdrop of the Taj Mahal. No photography inside the mausoleum. Ensure that you are not carrying any prohibited items (list detailed below). Security at the Taj is strict. Dress modestly. This is not enforced, but it is nice to be respectful. You must be quiet inside the mausoleum. Visitors must wear shoe covers to protect the site. You can get to the Taj Mahal via bus, train, or by hiring a private driver. Public transportation in India is often overcrowded, prone to rescheduling, and unorganized. Be sure to arrive at the stations early and pack some reading material and snacks in case of a delay. You can reach the Taj Mahal by train from New Delhi or Varanasi. From New Delhi, trains for Agra depart almost hourly. From Varanasi, the train services are less frequent, with only one train leaving per day. It is important to note that there are actually two train stations in Agra — Agra Cantt and Agra Fort stations. For the Taj Mahal, the most convenient station to disembark at is the Agra Fort station. 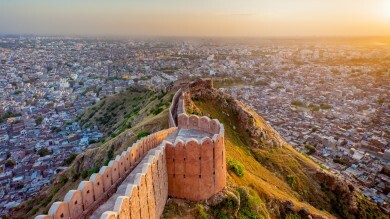 Various transportation providers offer frequent bus services to Agra from numerous different starting points around India (including Delhi and Varanasi). You can also fly in from different cities in India to Agra. Either ways, you will need to hire local transportation like bus, tempo, rickshaw, or taxi to get to the vicinity of Taj Mahal. You will also find prepaid taxis and autorickshaws at the rail station which is a more reliable but perhaps a bit costly option. Since diesel and petrol vehicles are not allowed inside 500 meter radius of the Taj, you might have to change to eco-friendly vehicles such as cycle rickshaw, horse-driven tongas, etc to reach the entry points. Since getting to and around the Taj Mahal can be hectic, you could consider booking a place of one of the many Taj Mahal tour packages that operate to and from the site each day. This takes some of the stress out of organizing your Taj Mahal visit. It is advisable to organize this with a reputable provider in advance, since there are many touts posing as tour guides at the site. Taj Mahal holiday services are sold by many companies in Delhi and Agra and a private tour can be enjoyed for less than USD 100*. In order to avoid confusion and save time and money, tell your driver exactly which gate you want to enter from. 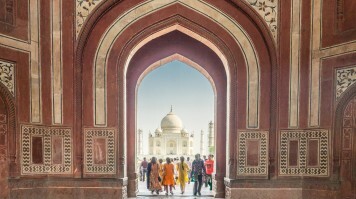 A Taj Mahal ticket entitles travelers to a small discount for entering other notable sites in Agra — including the Agra Fort, Sikandra, Itmad-ud Daulah, and Fatehpur Sikri. For an altogether more unique and perhaps romantic experience, it is possible to visit the Taj Mahal at night from 20:30 to 24:30. This is a particularly beautiful spectacle but is hosted only 2 days before and a day after a full moon. It should be noted that when opting to view the Taj at night, tickets should be purchased in advance since it is not open to everyone like during general admission times. Taj Mahal night tickets must be purchased from the Archeological Survey of India office at least one day before the event and cost USD 10.50*. This must be paid in local currency. There are three different gates to enter the Taj Mahal though the price is the same at each. When lining up to enter the Taj, the queues are segregated by gender — one for men, and one for women. If you are travelling as a couple or a mixed party, you should organize a place to meet inside. Be aware of pickpockets. It gets incredibly crowded in the mausoleum with lots of pushing and shoving. As such, you should ensure that you keep your valuables safe. Lockers are available outside the entrance which are a good option considering the Taj’s strict security policies. Prepare to be hassled both by toots and people wanting to take photos with you. Don’t be afraid to say no. If you decide to hire a professional photographer or a guide for a Taj Mahal tour once you arrive at the site, you should ask to check their photo ID to ensure that they are a licensed provider and not a local posing as a guide. It can get very hot during day, so wear breathable attire. Given the fact that the Taj Mahal is India’s biggest tourist attraction, it makes sense that it can get incredibly crowded. Though it can be overwhelming, you can offset some of the chaos by arriving early. Go in with an open mind and a positive attitude and remember that even though the vendors trying to sell you trinkets are annoying, you are standing beneath one of the seven wonders of the world! *Note: Prices are as of September 2018.